Apple's Phil Schiller on the new iPad name: "because we don't want to be predictable"
Perhaps the biggest news-making detail from yesterday's 3rd generation iPad unveiling was the naming scheme. We were largely expecting the high-res display and souped-up processor, but also largely expecting Apple to call the tablet iPad 3, iPad HD, maybe the iPad Retina, or anything in that line of thought. Much to everyone's surprise, the tablet kept getting referred to as simply "the new iPad" and there was no indication it will be called something else, even at the end of the announcement, with the only catchy word being "Resolutionary" to describe the slate. Everyone plus dog chimed in afterwards on the naming choice, and the analysts' reactions ranged from "marketing genius - Apple emphasizes that the tablet is just a tool for better visualizing its software, and the name will keep the thing fresh for a whole year now" to "this is the first huge mistake of Tim Cook as CEO and is going to cost Apple dearly, as customers will get confused". Apple stayed mum on the issue even when asked to comment on why it chose to call its third tablet simply "The New iPad", but Phill Schiller, its SVP of Global Marketing, budged and said "because we don't want to be predictable". Well, if that was the goal in itself, Apple certainly got its point across yesterday, when the whole tech blogosphere got treated to an "in your face" moment - after all, it was us that invented and popularized the iPad 3 or iPad HD monikers, not Apple. Whether the lack of a catchy name or simply a number for the new iPad was a good marketing move remains to be seen, although history shows that naming schemes haven't gotten in the way of Apple selling a boatload of its new gadgets anyway. Congratulation to PhoneArena, most of their rumors were right. Lmao apple is more predictable than tomorrow's date. They slightly update the obvious and call it new. Everything that was predicted to be on the iPad 3 was on the iPad 3. And still people will swear its the most innovating thing since sliced bread. I like apple products but they make me sick sometimes. "because we don't want to be predictable" - y u no try being unpredictable for your iOS also? Didn't want to be predictable, so they came up with "new iPad"? That's like your parents asking you to go buy a pet for the house, and you come back home with a watermelon instead and say "I didn't want to be predictable". This year they have released the 'new' ipad under the exact same name finally admitting that its just a re-release of the exact same product on the market already. So this model is the "new" iPad. 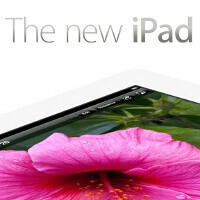 The next one in 2013 will be the "newer" iPad, and the year after that in 2014 Apple will name the latest one the "newest" iPad. So everybody will be confused when in 2014 the "newest" one is released but the "newer" one is discounted and you go into the store and ask for the "newer" model and they hand you the old model..........????? Yeh, right. That is such a lame excuse to not have a better name for it.